Keystone Bar Products (KBP) produces a wide variety of Square Edge Flats, Round Edge Flats, and Custom Sections. Located near Chicago, Illinois, we are positioned to provide quick turn-around on specialty sizes and grades. Customers also benefit from reduced shipping costs, improved customer service, and shortened delivery times. Billet, KBP’s primary raw material, is predominantly produced by our sister company, Keystone Steel & Wire, in Peoria, Illinois. 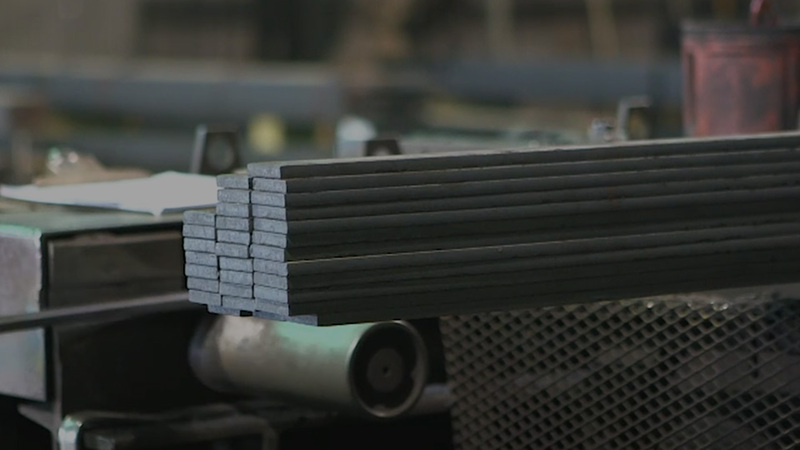 With the ability to oversee the entire process from start to finish, we know exactly what goes into every ounce of steel. The result is high-quality, consistent material. And, because the steel is melted, poured and manufactured in the USA, our products are Buy America compliant. Our very specialized and diverse products are used in many industries. Applications include agriculture, cold drawing, construction, industrial chain, energy and transportation. Furthermore, KBP materials are used in a wide variety of products by original equipment manufacturers. KBP can also provide annealing, shot blasting, special straightening and saw cutting. Customer service is a priority at Keystone Bar Products. Because of our alliance with Keystone Steel & Wire, KBP always has a steady, reliable supply of steel. With a focus on efficient production processes and cost control, we present an advantage over most foreign and domestic competitors. The results are uncompromising quality products that are delivered on time and for less cost, making Keystone Bar Products a valuable partner in the special bar industry. Contact us for additional information on Keystone Bar Products or to request a quote. KBP manufactures and sells exacting merchant and special bar quality steel products and special sections in carbon and alloy grades that are 100% made in America. KBP supplies a broad base of manufacturers, fabricators and service centers throughout the United States, Canada and Mexico. Located in Chicago Heights, Illinois, our 13″ Bar Mill maintains a 100-year-old tradition of rolling excellence and KBP customers rely on us for uncompromising quality products, superior service, and long-term reliability.